Yep, I made invitations for a wedding that didn't really exist. 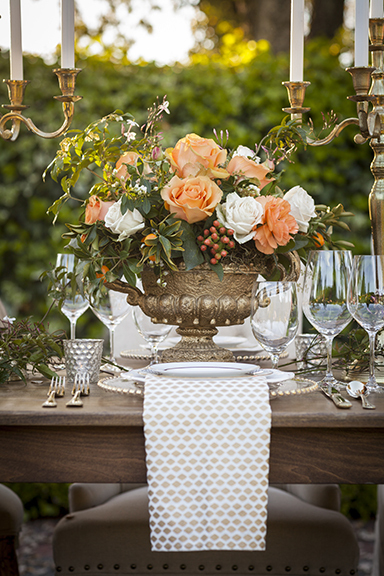 It was a staged photo shoot in Asti, California; the brainchild of Shauna Karver of j29 Events. Its purpose was to get picked up by the big wedding blogs and magazines, and I'm happy to say that photos from this shoot will be published in Smitten Magazine in October 2014. Photos were taken by Nathan Larimer, and are gorgeous! I can't wait to see what gets printed. Here are the three I chose as my teasers. The suite included a 2-color invitation, information card, RSVP card, menu card, and favor coasters. All printed pieces had rounded corners and gold edge painting. The envelopes were lined with Nepalese handmade paper with metallic gold diamonds to match the napkins in the table settings. Another view of the invitation suite. Here's a shot of the table setting. You can see the colors and elegance that I tried to carry through the invitations. After all, it is the invitations that guests receive first… they set the tone for the event and get the guests excited to attend. Back to school, back to work.